The inevitability of change. Change is the one thing that is permanent. The cycles of Karma - the sequence of cause and effect. "Kaph" means cup, or hand. Either holds water - showing the relationship between Key 10 and Key 12, The Hanged Man. "Kaph" is the "Soul Vessel," a metaphor that fits nicely with the idea of water held in a cupped palm. Kaph, soul vessel, and Throne are related, in that koss, which means "cup," and "throne," or kisey are both Gematria 86, the same as Elohim, the Divine Name that has the attribute of gevurah, in forming healthy boundaries. Like the Hanged Man, the Wheel of Fortune shows inversion, or a binary, on/off nature. The cup is either half empty, or half full, depending on how you look at it. This is where the numerical flip occurs in the tree. This is the transition zone, where the polarity is reversed. Here's a deeper look at the Tree - Helix. The hand of Kaph is in the act of grasping, and this image shows comprehension, as well as a hand grasping a doorknob. It is also the "palm of the hand," so we can see this as the protective "nest," "vessel," or "cradle" in which the cycles of the wheel can transpire. Grasping a doorknob and opening a door, grasping an opportunity, this is the "hand" that influences fortune, the subject of this key. It shows the learning that comes from repeated cycles, and the influence we can have over what seems to be chance. This is "In the Notch," "In the Groove," In the right place at the right time, in the Hand of God, Perfect Timing, Making all the Right Moves, Feeling at Home, Landing on Both Feet. Kaph is a "Double Letter," with two sounds. The wheel also shows conciliation, with its cycling aspect, and even distribution of direction. The Wheel is the Round Table of King Arthur. The wheel also symbolizes progress, advancement, and the Great Work. This wheel is like the wheels in Key 7, The Chariot, seen from the side. The eight spokes are the same eight points in Key 17, The Star. This is the wheel that is repeated 10 times on the clothing of The Fool, Key 0. On the spokes of the wheel, in the circle representing the formative world, are the alchemical symbols of mercury (top), sulphur (right), and salt (left). These respond to the three gunas of yoga philosophy: sattva (mercury), rajas (sulphur), and tamas (salt). The glyph at the bottom represents dissolution, and is also the Aquarius symbol. As long as the gunas maintain their equilibrium, Prakriti remains undifferentiated and the universe exists only in its potential, seed state. As soon as the balance is disturbed, a re-creation of the universe begins. The gunas enter into an enormous variety of combinations - all of them irregular, with one or the other guna predominating over the others. Rajas is the power by which that obstacle is removed and the essential form made manifest. Several chapters of the Bhagavad Gita analyze the gunas, and their involvement with every aspect of daily life, food, sleep, excretion, breathing, etc. Alternating in the circle of manifestion are the letters TARO and IHVH, the Tetragrammaton. The serpent Typhon, or Fohat, descending on the left shows cosmic vibratory force; it also is the serpent of the letter "Tet," in Key 8, Strength. Ascending on the right is Hermanubis (Hermes-Anubis), the jackal headed Egyptian god, showing evolution from lower to higher consciousness. His jackal head is clever, intellectual. His red color shows desire, enthusiasm, and activity. The sphinx at the top, holding a sword, shows the triumph of intelligence; having risen from the ashes, the evolved human soul holds the sword of cutting-through wisdom. Swords also appear in Key 1, and Key 11. These wheels are made of wood, and many are kept in public areas, where passersby keep them spinning at all times. They are inscribed with prayers so that by spinning them, people can send the prayers. (Praying machines?) Written on this virtual one is OM MANI PADME HUM - the Sanskrit Heart Mantra - Directing the meditator's attention to the infinite compassion and light at the center of each person's universe. These wheels must always turn clockwise. Judaism has the concept of "Gilgul Nefesh" - the Wheel of Souls - that is, Reincarnation. This idea is not common among more westernized Jews, but in the Chasidic world it is common. One familiar idea is that Noah was a later incarnation of Adam ha Rishon (the original Adam.) One thread of this trend of ideas is that parts of souls can blend with parts of other souls, sometimes during a single lifetime. Other wheel images: A pump, a turbine, a revolving door, a merry-go-round, a washing machine, a squirrel wheel. This is the Karmic impeller of the Tree. 10 is the number of the tenth Sepher, Malchut. dissolvit ut glaciem. it melts them like ice. fero tui sceleris. to your villainy. semper in angaria. always enslaved. mecum omnes plangite! everyone weep with me! David Dodd's commentary on "The Wheel" is illuminating. Jupiter's placement at birth sets the character for the person's Higher Mind; their relationship with the 'inner guru.' It shows appetite and capacity for learning, and the flavor of one's enthusiasm. Jupiter transits bring opportunity, lucky breaks, prosperity, learning phases, etc. Jupiter takes 11.86 years to complete it's orbit through the zodiac. Jupiter infuences the bounty of life, and the range of spiritual or intellectual experience. Jupiter is the principle of blessing and well wishing. Thanksgiving, the holiday of gratitude, is on the first Thursday [Thor's Day] after the sun goes into Sagittarius [Jupiter's sign]. Afflictions to Jupiter create poverty (spiritual or physical), or excess. Jupiter is a 'Guardian Angel' who protects, like a 'Get Out of Jail Free' card. It's presence can make a bad situation livable. Jupiter impaired can create lack of imagination, or squandering of energy. 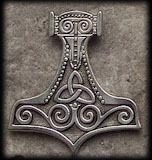 Jupiter is Thor - Thor is the Thunderer, who wields Mjölnir, the divine Hammer. His chariot racing across the sky generates the rumbling, crackling racket that accompanies a storm. 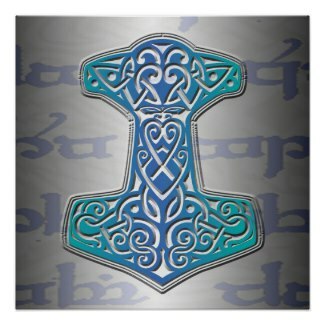 Thursday (Thor's Day) was named after him. Jupiter's thunderbolt strikes the Tower, Key 16. There is an additional discussion of Jupiter on the Glyphs page in the left frame. Jupiter is Exalted in Cancer, and Rules Sagittarius. Jupiter's detriment is Gemini/Virgo and its fall is Capricorn. The Sepher associated with Jupiter is Chesed.